There’s one theory about Donald Trump’s victory in the presidential contest that I haven’t seen floated much yet: maybe he’s The Antichrist. If he is, white evangelicals missed it. More than eighty percent of them voted for him. In fact, since the 2016 election was so close, they probably provided him with an absolutely crucial margin of victory. Is it possible that the very people who made The Antichrist a thing forty years ago, who told us exactly what to look for and what was going to happen, not only missed his rise to power, but are largely responsible for it? Looking back at the last forty years of the white evangelical church, it seems not only possible, but well-nigh inevitable. I don’t remember when I first learned heard about The Antichrist — could have been a Chick Tract, could have been somebody in church talking about The Late, Great Planet Earth, could have been me picking up TLGPE in a church library and thumbing through it. I didn’t hear it first in a sermon, I can tell you that much. Premillennial dispensational eschatology dominated the popular culture of the evangelical 70s and 80s, but wasn’t generally an official, top-down, doctrinaire, from-the-pulpit sort of belief. As a baby evangelical, I was aware of the overarching narrative and had a vague conception that it was what “we” believed, although I also knew it was an area of controversy. The world is going through a time of unprecedented upheaval, crisis, and danger, as foretold in the prophetic book of Revelation. In the face of all this strife, people will turn to a powerful, autocratic leader in service of evil, The Antichrist. He will rule over a worldwide fascist surveillance state, a New Rome, in which people will have to wear the “Mark of the Beast” in order to buy, sell, or work in the official economy. He will do away with religious freedom, establishing himself as a cult figure who must be worshiped by all. He will seek to crush Christians in particular, because they will not worship him, and are therefore a threat to his power. He will have a right hand man, a second beast, and a false prophet, who will function like an Anti-John-the-Baptist to his Anti-Christ When his power finally crumbles, it will be through World War Three, which will end the human world as we know it and trigger the second coming of Jesus and the Final Judgment Day. Nuclear weapons and environmental collapse are going to be involved. The Soviet Union, the restored Israeli state, and the European Union are all going to play a big role. And the number 666 is some kind of secret code that will tell you who The Antichrist is. In 1979, there was a “documentary” based on The Late, Great Planet Earth, which had television commercials. I’m certain that I saw these commercials, and that this is probably what made The Antichrist seem a lot more real and scary all of a sudden. I decided to read Revelation for myself. This was unexpectedly comforting. I discovered nothing at all like the clear blueprint for the end times that I had been promised. Instead, I found an entertaining but obviously highly symbolic book, which also repeatedly stated that its own prophecies were going to happen “soon.” As in, more than a thousand years ago. It was fairly easy to imagine it all having to do with the upheaval in the Roman Empire, and the rise of Christianity as a major worldwide religion. It was difficult to imagine it pertaining to 1979 America except in a metaphorical sense. It was particularly difficult to imagine it yielding a timeline and scenario as precise as the one envisioned by Hal Lindsey and others. hail and fire mixed with blood, and it was hurled down on the earth. A third of the earth was burned up, a third of the trees were burned up, and all the green grass was burned up. [..] something like a huge mountain, all ablaze, was thrown into the sea. A third of the sea turned into blood, a third of the living creatures in the sea died [..] a great star, blazing like a torch, fell from the sky on a third of the rivers and on the springs of water — the name of the star is Wormwood. A third of the waters turned bitter, and many people died from the waters that had become bitter. [..] a third of the sun was struck, a third of the moon, and a third of the stars, so that a third of them turned dark. A third of the day was without light, and also a third of the night. The star was given the key to the shaft of the Abyss. When he opened the Abyss, smoke rose from it like the smoke from a gigantic furnace. [..] And out of the smoke locusts came down on the earth [..] The locusts looked like horses prepared for battle. On their heads they wore something like crowns of gold, and their faces resembled human faces. Their hair was like women’s hair, and their teeth were like lions’ teeth. They had breastplates like breastplates of iron, and the sound of their wings was like the thundering of many horses and chariots rushing into battle. They had tails with stingers, like scorpions, and in their tails they had power to torment people for five months. They had as king over them the angel of the Abyss, whose name in Hebrew is Abaddon and in Greek is Apollyon (that is, Destroyer). If you’re going to get literal about things like the number 666 or the name Wormwood, you also have to get literal about battle locusts with human faces. That’s the point where the whole thing starts to fall apart. Revelation was obviously not an occult work to be decoded for secret messages about current events. So I put it out of my mind. I remained worried about things like nuclear war and environmental catastrophe and despotic rulers purely for their own sake. But I didn’t worry about The Antichrist anymore. I was merely amused by things like the Left Behind series and Jack Van Impe’s TV show. Over time, interest in The Antichrist seemed to wane. The collapse of the Soviet Union seemed to be the real death stroke there. Nearly every frantic end times prophecy had the USSR playing a huge role (Gog or Magog, I forget which) and involved some form of nuclear war between the US and the USSR. End times fears probably always functioned mostly as a proxy for Cold War fears. And yet, here we are, in 2016, and Russia — not the USSR — potentially played a huge role in the outcome. It’s certainly not much of a stretch to say that Russia tried to influence the election, and had a clear preference for the candidate who ended up winning. The Cold War is long over, but we still have all those nukes, don’t we? And isn’t Russia still huge and kind of scary? If the USSR had tried to influence the 1980 election, and if their clear preference was Ronald Reagan, wouldn’t that have triggered massive alarm bells among Antichrist-fearing Christians in the 70s and 80s? One idea Trump has floated is a “registry” for American Muslims. Trump’s evangelical base seems completely unconcerned with this. Doesn’t anyone realize how easily a registry for Muslims becomes a registry for all religions, then becomes the Mark of the Beast? I mean, I know the popular Antichrist mythology of the 1970s and 80s held that he was going to be coming for evangelical Christians first, but a world without religious freedom, where Politically Conservative Evangelical Protestant Christianity is the only religion that can be practiced openly, is a world where the church is just as dead as if Enigma Babylon One World Faith were the only religion allowed. Evangelicals, you used to know this stuff. I know this because you taught it to me when I was a child. The evangelical church is where I learned these things. If there’s no free will, no way for a person to make their own choice to follow Jesus or not, then SALVATION IS NOT POSSIBLE. If you follow Trump all the way down Theocracy Road, you will have snuffed out the light. It won’t be the church triumphant. It will be the church dead and rotting. Trump is everything we ever expected in an Antichrist. He’s famous, amoral, and filthy, filthy rich. In fact, Donald Trump is the very embodiment of Mammon, a concept used by Christians since the beginning to symbolize the greedy worship of money and earthly riches. He’s not just a rich dude. He clearly holds money as his idol, as the one thing he truly believes in (other than his own ego). He came to prominence in the 1980s and has always espoused that era’s “greed is good” mantra. Everything he does is about increasing his own wealth, often at the expense of others, unless it’s also about showing off his wealth. He has a “Trump brand” which is marketed as the utmost in luxury, indulgence, and high living. His wealth was one of his major sales pitches for himself as president, sold as if it were proof not only of competence, but of leadership qualities, even virtue. Doesn’t that ring any alarm bells among Christians? Has the rise of corrupt “prosperity doctrine” clouded your eyes that much? Jesus himself said “No one can serve two masters: Either he will hate the one and love the other, or he will be devoted to the one and despise the other. You cannot serve both God and money.“ Well, which master do you think Trump serves? It’s not like he’s kept his worship of money a secret. Yet, he pretends to care about the church. He pretends to care deeply about YOU, white evangelicals. “Donald Trump made the most full-throated and aggressive appeal to evangelical voters … since Ronald Reagan spoke to the Religious Roundtable in August of 1980,” Ralph Reed, chairman of the Faith & Freedom Coalition, said the day after the election (Nov. 9). But what is he centering, here? Not Jesus as your savior. HIMSELF as your savior. 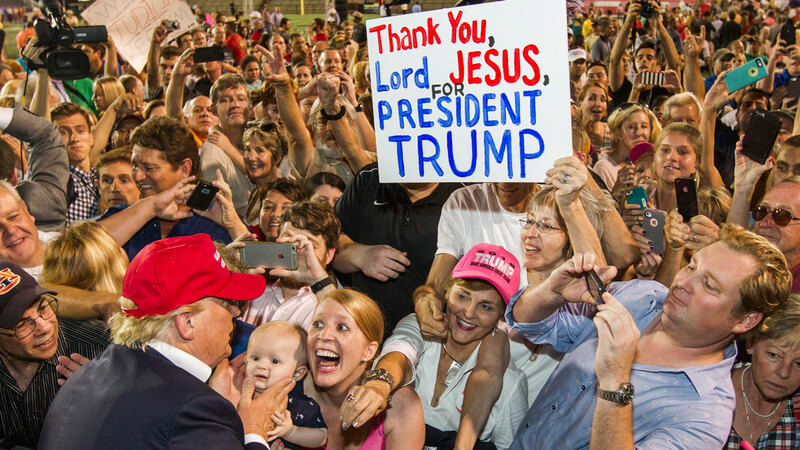 His campaign was largely a cult of personality, with passionate rallies centered on Trump worship, and extravagant promises that he, and he alone, was going to save you through his power, his strength. He wasn’t offering practical solutions. He was offering magic. Sorcery. And people ate it up. I hear half the media saying that these are lies. [..] people that say facts are facts — they’re not really facts. [..] There’s no such thing, unfortunately, anymore as facts. [..] Mr. Trump’s tweet, amongst a certain crowd [..] are truth. When he says that millions of people illegally voted [..] his supporters [..] believe they have facts to back that up. Those that do not like Mr. Trump, they say that those are lies and that there are no facts to back it up. Think about what she’s saying, here. If you believe in Trump, you believe what he tells you, whether it is factual or not. If you don’t believe in Trump, you still recognize that a thing which is not true, that is, that has no facts to back it up, is a lie. But in her model, these are just two opinions, two sides of a debate. On the one side, Trump is the truth. On the other side, the truth itself is still the truth. But if you’re a Christian, Jesus is supposed to be your truth. When you make Trump your truth instead, you have allowed him to displace Jesus. Hence: he is The Antichrist. This year, people haven’t been able to stop remarking about how bizarre, strange, and unprecedented this presidential election seemed at every stage. Even without the election, 2016 has been full of strife and tragedy and upheaval, in the world at large, and in people’s own lives. We joke about it being the result of too many time travelers coming back to “fix” our timeline, or about this being what regular people see when wizards are having a battle. But maybe there really are terrible supernatural forces at work. When Trump supporters seem uncannily mesmerized by his presence, maybe that is literally what’s happening. When members of the mainstream news media see his open contempt for them and hear his vague but horrifying promises to do away with the first amendment to the Constitution, but respond with a shrug and an attempt to fit him into a standard president-elect narrative, maybe there’s more to it than laziness and bad journalism. Maybe there was more than bad journalism at work in the media’s decision to focus obsessively on tiny specks in Clinton’s eye, while all but ignoring whole skyscrapers of misconduct in Trump’s. Maybe there’s a reason Trump opponents, since the election, have felt not just disappointed, but full of dread. There’s something going on. It’s not normal. It’s not politics as usual. That’s exactly what Trump voters wanted, right? To shake things up? Change things around? Maybe usher in Armageddon to end the human world as we know it? I remember puzzling over the polls in the summer and early fall, wondering how it was possible that Hillary Clinton could open up such huge leads when voters encountered her and her opponent directly — as they did during the conventions and the debates — only to have her lead collapse rapidly when both candidates were out of the spotlight. It seemed unnatural. It was as if, when voters saw the reality in front of them, they preferred the reasonable and qualified candidate over the incompetent blustering fool. And then they’d sort of… forget. As if they were under a spell. Certainly, it felt significant when FBI Director James Comey released, a little more than a week before the election, the news that he had found potential Clinton emails on the laptop shared by Huma Abedin, Clinton staffer, with her husband Anthony Weiner, as part of an investigation into Weiner’s misdeeds. At that point, nobody had any idea what these emails contained, whether they were new information, whether any of them were even from Clinton. It should have been at most a minor curiosity. Instead, it was like dripping blood into a piranha tank. Just saying “Clinton” and “email” in the same breath seemed to get everyone in the media slobbering all over themselves to give a fresh take on a scandal that barely existed in the first place. It was like watching a bunch of primed, brainwashed operatives go into action based on a deeply conditioned trigger. Or, you know. Like watching people under a spell. And the spell worked. Voters who were undecided until the last minute — that is, those who were not already under his sway, or who had not already seen through his deceptions — broke overwhelmingly for Trump. But what about Mike Pence, Trump’s Vice President, the other beast, the false prophet who plays anti-John-the-Baptist to Trump’s Antichrist? He seems to be, I’m afraid, a completely sincere right wing conservative culture-wars type of evangelical, and embodies everything un-Christ-like in that particular movement: a burning desire to use the power of government to enforce certain sexual taboos, combined with laissez-faire economic libertarianism and utter indifference to the real harm any of his policies might cause to vulnerable human beings. Like many of his ilk, he will tell you that he’s quite certain that he’s doing God’s work on earth by attempting to punish and shame women for having abortions, and to torture LGBTQ young people until they pretend to be straight. But Jesus never talked about abortion or homosexuality. He told us to feed the hungry, care for the sick, visit the imprisoned, and welcome strangers. Pence doesn’t care for any of those groups. He’s not even truly interested in preventing abortions, only in making them illegal, proven by his repeated attempts to defund Planned Parenthood. Planned Parenthood provides contraception, which is the most effective method available to prevent abortions. Pence has the soul of an Iniquisitor, a torturer of infidels, a burner of witches. He is interested only in the ways religion can be twisted into a tool of oppression, unrestrained by either compassion or truth. Certainly, in his debate against Democratic VP candidate Tim Kaine, he proved himself willing to lie shamelessly in service of Trump. According to Fox Carolina, Shupe identified himself as a conservative Christian who supports Donald Trump. Mysteriously direct messages “from the Lord” justifying what you wanted to do anyway have been a staple of the evangelical sub-culture for as long as I can remember. But when I was a kid, this story would have ended very differently. It would have been about the man perhaps wanting to walk away, but then recalling the parable of the Good Samaritan, and feeling a “burden on his heart” to bring this misguided young woman around to the true path, and his kindness and good service would have caused her to re-evaluate her prejudices against Christians, and she would have agreed to go to church with him, and there’s another soul won, hallelujiah. It’s easy to be cynical about the self-serving way the evangelical tale-teller becomes a hero just for doing his job, or the way he can’t simply help a person who needs it, he has to have the ulterior motive of “bringing them to the Lord.” But at least in the older story, he would have done more or less the right thing, even if it was for self-serving reasons. In the modern story, he doesn’t even do the right thing. He tries to make himself the hero for doing the wrong thing. This is Trumpianity in a nutshell. Do the exact opposite of what Jesus told you to do, say it’s because you’re a Christian, and walk away feeling really righteous and pleased with yourself. Whatever you do, don’t ask yourself where that feeling of righteous certainty really comes from. Because you “know” you’re a Christian, you also “know” that any voice whispering in your ear must be the voice of the Lord. And it is. If you listen to that voice, it’s the voice of your Lord. But is that Lord Jesus? Did Jesus come to earth and say, “love your neighbor as yourself, unless your neighbor is a liberal or a gay or something like that, then screw ‘em.”? Or did Jesus say, “love your enemies and pray for those who persecute you.”? I think you know which one it is. Wait a minute, did he just openly admit they’re the bad guys? He did, didn’t he? He just declared for Satan. Literally. FOR SATAN. And not the Church of Satan kind of Satan, either, where they worship a kind of pagan Satanic libertarian principle and don’t actually believe, literally, in the evangelical version of Satan as ultimate bad guy. Bannon compared Satan to Darth Vader. He’s speaking in praise of darkness, being the bad guy, as a means to power. He clearly means the evangelical version of Satan, where Satan is the ultimate, eternal, worst villain of all, and one who offers earthly power in exchange for your immortal soul. How could the same evangelicals who spent the 80s combing obsessively through secular rock music for secret, hidden, backwards tributes to Satan ignore this man shouting “hail Satan!” in the plainest of terms? A man who is going to be part of the White House staff, a close confidant and adviser to the President of the United States of America? Doesn’t any of this trigger any alarm bells at all? Look, I know you, white evangelicals, and I’m sure you didn’t consciously vote for Trump because of his ties to the neo-Nazis of the so-called “alt right.” Maybe you didn’t even know about them. But you can’t deny what’s happening all around you. Actual, literal, open neo-Nazis are out there hailing Trump’s victory and claiming it for their own. Jesus told you to beware of false prophets, and that you will know them by their fruits. Jubilant neo-Nazis are Trump’s fruit. Hate crimes are Trump’s fruit. What does that tell you about him? 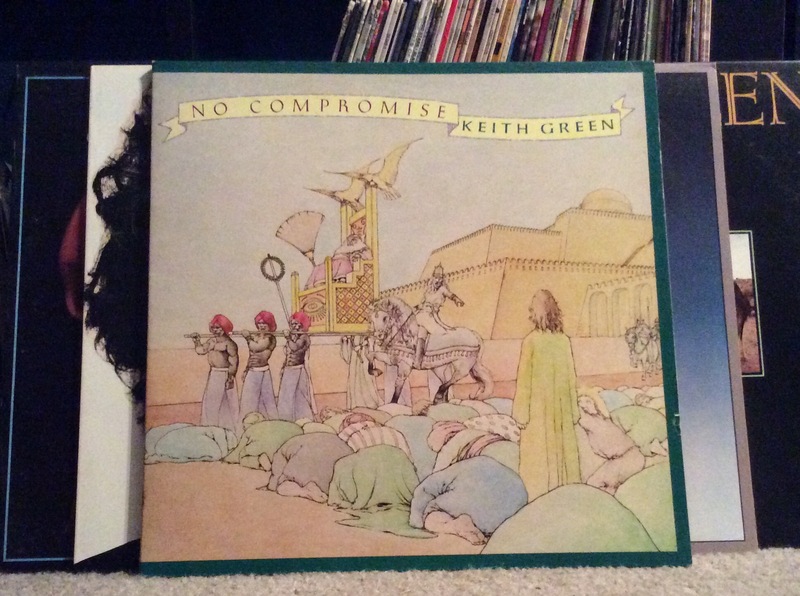 My people always told me that they would be the ones standing up for what was right, standing firm, just like on the cover of this No Compromise, this Keith Green Christian rock album. Instead, they were the first to bow down. All that said, I haven’t changed my mind about the book of Revelation. I still don’t believe the Hal Lindsey/Chick Tract/Left Behind/Jack Van Impe premillennial eschatology is a true reading of that book, or of the Bible in general. I still believe Biblical warnings about false prophets and Anti-Christs are general principles, rather than specific prophecies for our times. I still believe the supernatural is best regarded as (mostly) metaphor. But I now believe the premillennial eschatology that came to prominence in the 70s and 80s was prophecy of a different sort. It was a warning, delivered to the conservative evangelical Christians who were becoming increasingly defined by their devotion to a political ideology and not to a spiritual savior. But that warning was delivered by the very people working to bring that corruption about. The warning itself became part of the deception. When conservative right wing evangelicals told you about The Antichrist, they weren’t looking to the Bible for revelation, and telling you what they found. They were telling you WHAT THEY PLANNED TO DO. And now they have done it. God help us all.